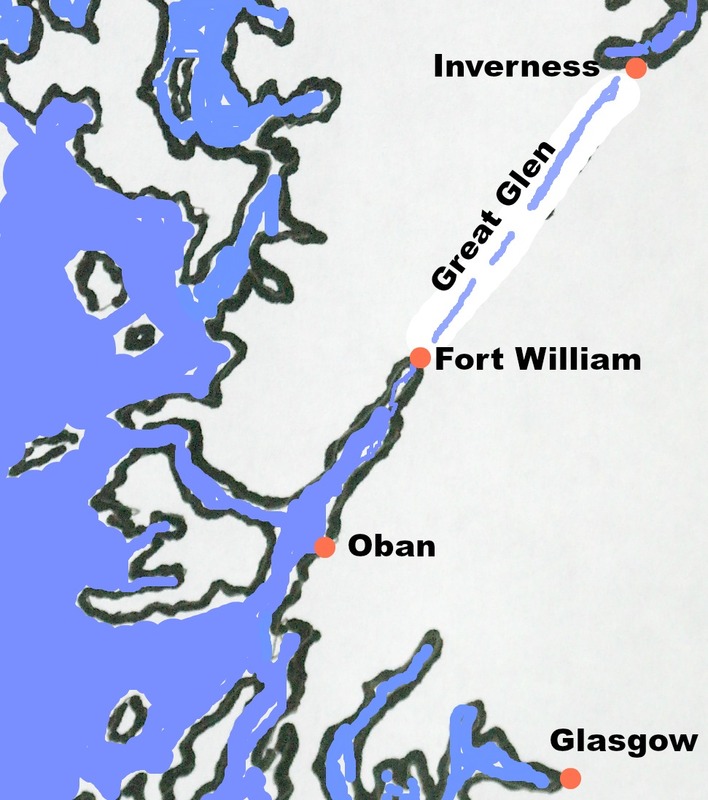 In planning a tour of the West Highland seaboard of Scotland, most visitors are faced with the Oban or Fort William question. Which one makes the better base for exploring the area? Both are quite substantial communities (for that thinly-populated part of Scotland). Both are sited by salt water. Both have a wide range of accommodation and things to do in and around the towns. The two places lie only 44 miles / 70 km apart by road and there is public transport. Railways and buses serve both. A cycleway (mostly) also links them. So whichever one you choose you can certainly see both places. If you are driving or touring you can also easily take the longer route between them that takes in Rannoch Moor and Glencoe and goes via Tyndrum. Is either Oban or Fort William worth visiting? Fort William could be described as unavoidable for road tourers in the West Highlands. It’s a natural route centre. Ben Nevis is a recurring theme as well as a dominating landmark in the Fort William area. It seems to be many a retiree’s dream to have a house with a view of ‘the ben’ - and lots do! When the weather is clear the mountain certainly seems to soar and is very conspicuous on the approaches to the town. Here it is as a backdrop to one of the locks of ‘Neptune’s Staircase’ - the set of six locks on the Caledonian Canal where it reaches the sea at Loch Linnhe at Banavie, close to the town. Oban, on the other hand, is more of a gateway than a route centre. For generations of local folk its role has been that of a vital ferry hub for island connections. For road travellers on a Highland tour, simply turning north at Tyndrum (where you find the ever-popular Green Welly Stop) means you can miss Oban altogether. So in deciding to visit either Oban or Fort William, your itinerary could bypass Oban but will be hard-pressed to avoid Fort William if you are intending to do any kind of Highland exploration. Pull out the map in your sea-front hotel in Oban and you’ll see beguiling invitations in and around the place to take in Seil and the Slate Islands, Dunstaffnage Castle, Dunollie Castle, the Sea Life Centre, the local museum (Oban was an important seaplane base in WWII), the local distillery, plus a variety of fine gardens and the prehistory of Kilmartin Glen - or a dozen other things from forest walks to a former 18th-century iron-smelting site. And that’s before you’ve even started considering day trips to the islands or seal cruises or longer ventures out to the islands of the west. This shows (roughly!) the relative distances of a few Scottish touring destinations, notably Oban and Fort William. It’s a pleasant and scenic drive between the two, mostly by the salt-waters of Loch Linnhe. Do the same with that map in your Fort William Hotel and you’ll see straight away that the place screams ‘Scotland’s Outdoor Capital’ at you. It’s in the shadow of Ben Nevis (and all that…) and as one of the wettest places in Scotland it’s a brilliant piece of branding. The Caledonian Canal’s big set of locks at Corpach - ‘Neptune's Staircase’ - is also interesting (there’s that word again) and further afield there are all the delights of the road to Mallaig. This route through fine Highland scenery is often labelled ‘The Road to the Isles’ and is where - for example - visitors used to stop off at Glenfinnan for the association with Bonnie Prince Charlie. Now the majority stop off for the association of the Glenfinnan Viaduct with the Harry Potter movies. So both places have plenty of diversions and points of interest. Fort William has rugged scenery really close by. Oban probably gets better sunsets and has a more salty sea-going air. An unbeatable range of options afloat in Oban. Seals, basking sharks and so on, all queue up in the main season to sport in front of the visitors. Well...sort of. Oban or Fort William - as towns to visit? Both places are heaving with visitors in the main season. Fort William because you can’t avoid it and Oban because it’s a traditional resort and also where folk make their ferry connections to the Scottish islands. Oban has a fine promenade and a sense of bustle. We have a separate page on the story of Oban with lots of pictures. It’s a nice place to stroll around. Walk out as far as Dunollie Castle in one direction. Stroll around the ferry pier to watch the ships come and go - and enjoy a beer , a seafood sandwich or fish and chips. It’s that sort of a place. Looking out to the island of Kerrera that shelters Oban Bay (left) from Dunollie Castle, a pleasant short walk from the town of Oban. The much larger island of Mull is on the right, distantly. Fort William main shopping street. Ho-hum. In Fort William centre there is one long pedestrian-friendly street. There is no sense of connection with the sea (Loch Linnhe) because, historically, the railway cut the town off from the water. When the station was re-sited in 1975, a little way towards the edge of town, a road bypass was built between the town and Loch Linnhe. So, while downtown Oban looks out across the water, downtown Fort William turns its back to it. ...same street, looking in the other direction. 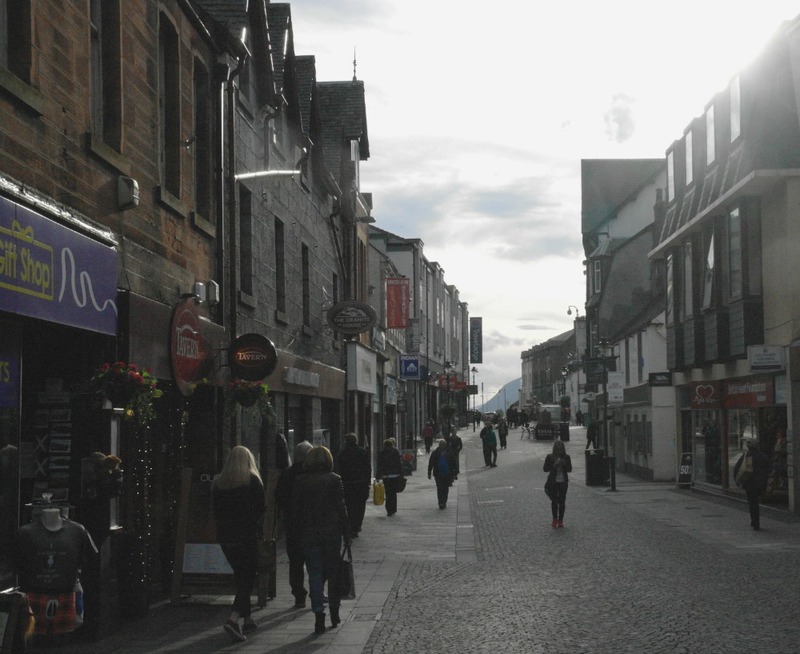 Perhaps as a consequence, whereas Oban has a sense of something going on, Fort William has, well, a long straight shopping street with visitors wandering aimlessly up and down. That’s just how the two places developed. However, at least Fort William has the mountain of Ben Nevis at its back. A short diversion from the main road between Oban and Fort William takes you round via Port Appin, from where you can enjoy this view across Loch Linnhe. just tell me - Fort William or Oban - where should I stay? If you are a keen hill-walker, climber, skier, mountain biker, marathon runner or terribly, terribly outdoorsy in any of these ways, then you will be attracted to the landscapes and facilities of the Fort William area. If you are less inclined to strenuous pursuits though, then something like the Jacobite Steam Train (which connects Fort William and Mallaig) may still also appeal. Repeat, Fort William has a good choice of things to see nearby if you make it a touring base. The problem is that the actual town itself is a bit dreich. There’s that good Scots word to describe everything from the weather to the experience of aimlessly wandering up and down in work-a-day Fort William with not a huge amount to see right there within the town. Oh, sure, there are shops, oh, and a dog-friendly pub called the Dog and Drool. No, wait, it’s really called the Grog and Gruel. The impressive Glenfinnan Viaduct, photographed in the evening from up the glen - an easy drive from Fort William for all you Harry Potter people. OK, it hasn’t got a big mountain in its back garden - but it’s got islands on its horizon and, paradoxically, always feels more, well, Scottish, somehow. Even with the tide out, Oban just seems a cheerier kind of town. So, personally, it’s Oban every time for us. Besides, from a touring point of view, you can take in somewhere like, say, the Ice Factor at Kinlochleven or even dramatic Glencoe just as easily from Oban as you can from (slightly nearer) Fort William. Unless you need to climb Ben Nevis with an early start (or far that matter any of the other mighty hills of Lochaber); or unless you are on such a tight schedule that you have to miss Oban anyway - only under this kind of circumstance would a stay in Fort William be better than a stay in Oban. Ringed by big hills and set at the head of fjord-like Loch Leven, Kinlochleven has a completely unexpected industrial story to tell. Once it smelted aluminium, using local hydro power. The village housing reflects this, with the faint air of a former mining or mill community about it. The Ice Factor in Kinlochleven, housed within a former smelter building, is described as the world’s largest indoor ice wall climbing facility. Easily reached from Fort William or Oban. Both towns have excellent accommodation choice in the hinterland: really top flight places like Inverlochy Castle near Fort William or Isle of Eriska Hotel, Spa & Golf near Oban. Then are more mid-range but excellent venues such as or the Glenfinnan House Hotel west of Fort William - we've had some really enjoyable bar food there - or the Holly Tree Hotel at Kentallen (between the two towns). This is one of our personal favourites and recommended without hesitation. Choosing this kind of base means you have the benefits of a rural location though easy access to town facilities by way of shops and so on. Similarly, both Oban and Fort William have good self-catering choice in and around. In any case you could argue that it doesn’t really matter which of the two you choose as you probably will be spending time outside them, taking in all the Highland scenic and activity stuff - especially the ‘Road to the Isles’ running west from Fort William.